The cottage is one of my favorite places. There’s so much to know about it and so much to see that I’ll have to do it in several installments. When we were back in Vermilion this time we made some new discoveries. This watercolor below was painted by a neighbor in 1961 (when I was 3 years old). 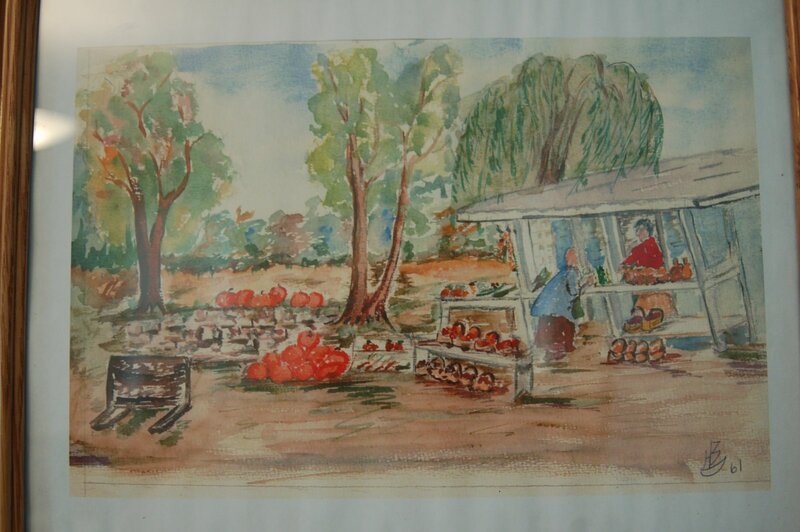 It depicts my grandmother’s fruit and vegetable stand that was just down the road from the cottage. That’s how their family made a living and probably why she had so many kids. She was an amazing gardener with a huge farm full of everything delicious…acres and acres of fresh sweet corn, watermelon, turnips, apples, peppers and dozens of other healthy treats. I used to stay with her and my cousin, Karen on the farm for a few weeks every summer. It was heaven! Even though this painting is far from professional, it brings back wonderful memories of her place. But I digress…this is supposed to be about the cottage. 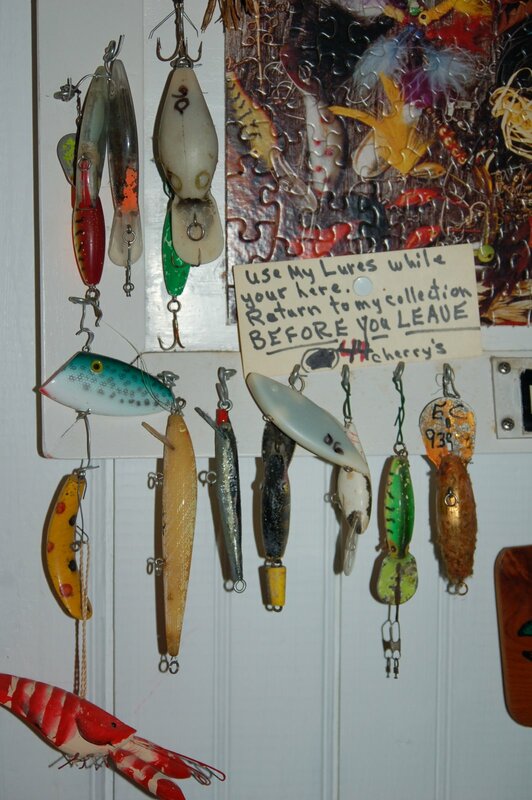 LURES: My uncle has a boat and loves to fish on the lake. He used to take us out when we were kids. You can see that he has all of his lures hanging on the wall at the top of the stairs for anyone who comes to visit and wants to use them. 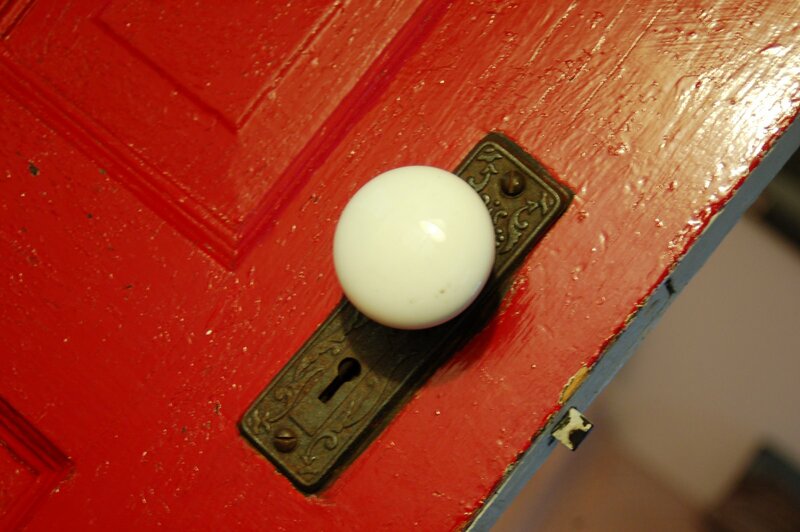 DOORKNOBS: The house is filled with working vintage doorknobs! 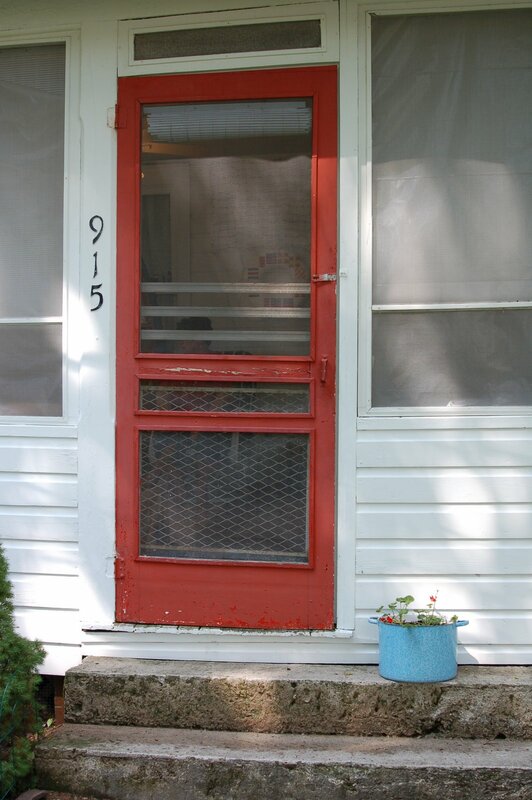 This one is their front door. I have more pics of the knobs, but won’t bore you with those. Once I get all my pics online, I’ll link so you can see everything. 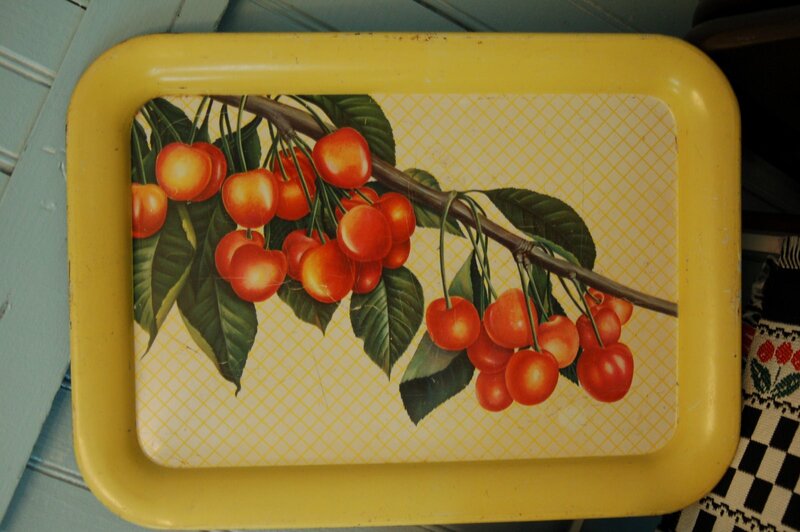 CHERRIES: My aunt & uncle’s last name is Cherry, so the kitchen is filled with bunches of vintage cherry decor. This tray is just one example. LOVE NOTES FROM OUR HOSTS: Over the years as my aunt & uncle having lovingly cared for and shared the cottage, they’ve discovered all the important do’s and don’ts that keep it the special place that it’s become. 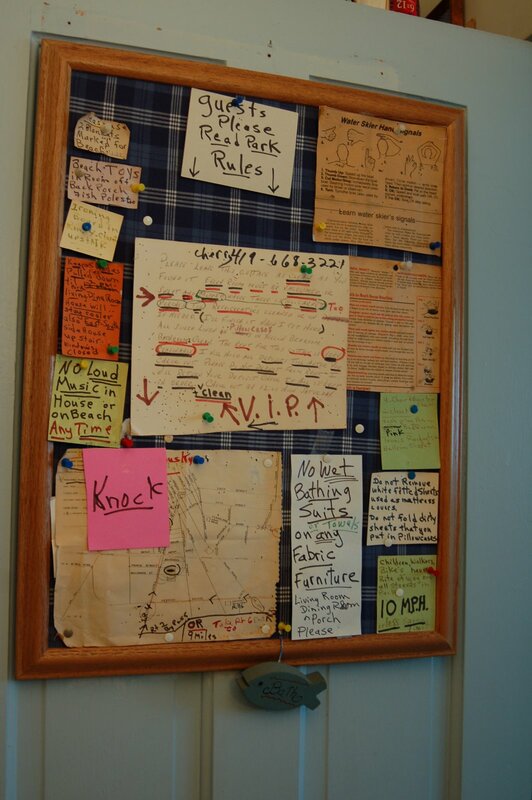 This bulletin board is a sampling of the loving notes from our hosts that ensure that we all have a grand time and keep the cottage in one piece. LUCKY STONES: I showed you some of the beach glass collection in my last post and now you need to learn about lucky stones. 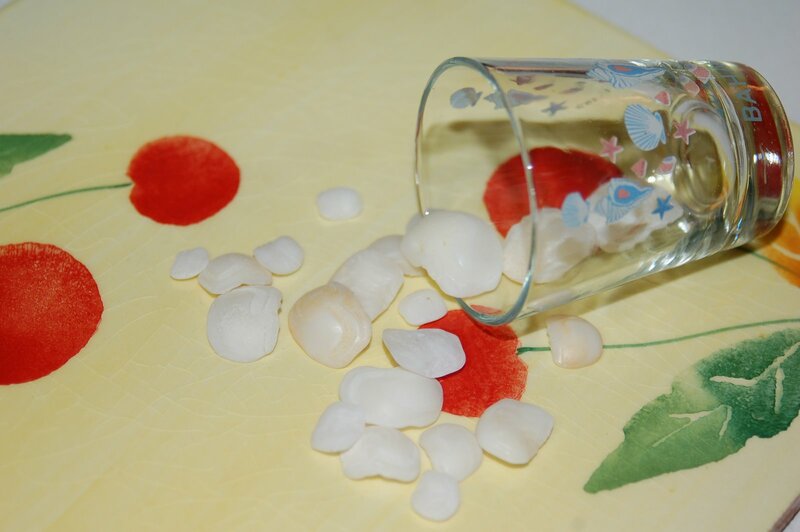 The stones in the shot glass are called “Lucky Stones”. They’re not actually stones at all. (Click the link to find out more.) If you click on the photo you can see the “L” on each one. We spent many hours in our youth looking for these on the beach. The cottage guests have collected them over the years and we saw several cups full around the house. My aunt says that when you give them to someone else they are a gift of love and become “Lucky Love Stones”. My sweet cousin, Elaine gave me a pair of earrings and a necklace that she made from these. Wow, did I feel loved! Well, that’s all for now…more to come. Oh such lovely vintage goodness!Makes me want to start a collection of door knobs… or at least door knob pictures!